The Wheatsheaf is a typical 18th century timber framed building that was originally a single story with a thatched roof. We are unsure if the upper floors were added separately or both at the same time but we do know, due to findings during recent refurbishment work, that the timber frame was extended to support both the first and second floors. Our cellar, we suspect, was built around 1910 and is of steel frame construction with vaulted brick ceilings, supported by a central brick wall. During excavations for our beer garden in August 2016 we uncovered some original slate flooring that we suspect was a barn floor. The floor was approximately 1m below the current ground level. We also uncovered an underground culvert running the length of our drive and up towards Piccadilly. The culvert was covered with 50mm thick slabs of stone that measure approximately 2m x 800mm and an experts opinion is that the culvert was covered in the 1950’s and is still active, but probably only during heavy rains. We managed to salvage one of the stone slabs and, under expert guidance, recovered that part of the culvert with a modern equivalent . The original culvert cover will become a feature in our new beer garden. The Wheatsheaf holds many secrets. Some we know about and some are yet to be discovered but, for sure, the history continues to be made. Thank you to The Whitchurch Heritage Centre for their research and notes below. The building at 19 (formerly 15) Green End has been known as The Wheatsheaf Inn since 1861. Though prior to this date beer and ale were sold from the premises, probably through the front windows, hence the phrase Ale House. In Pigot’s trade directory of 1835. Hannah Wycherley was listed as a retailer of beer in Green End. Five years later the same information appeared in Robson’s trade directory. Hannah Wycherley*, head of the household was a 76 year old widow. Her occupation was given as beerseller, later a sadler’s wife, who had been born in Adderley, Shropshire. Living with her was her unmarried daughter Eliza, aged 30, who assisted in the house. In 1861 the Census listed Eliza Wycherley aged 40 as the head of household with the occupation of Beer House Keeper. Hannah, aged 85, was still living on the premises. Slater’s trade directory of 1868 contains an entry for The Wheatsheaf, listing the proprietor as Mrs Eliza Hughes. A search through St Alkmunds Parish Records reveals the marriage of Eliza Wycherley to George Hughes in November 1862. The 1871 Census shows that Mrs Eliza Hughes was the licensed victualler but that she was now a widow. Her 21 year old niece Hannah Wycherley lived with her as well as a 16 year old servant. Eight years later Kelly’s trade directory lists the proprietor as Mrs Mary Hannah Wakefield and the following year, in 1880, Slater’s directory names Thomas Wakefield as proprietor. By 1881 it would appear that the residents and therefore proprietor of the Wheatsheaf had changed again. The Census listed James Hodgson as the head of household, aged 29. He combined the jobs of innkeeper and Master Builder. According to Trade Directories of 1885 and 1888 Arthur Potter was the licensed victualler at The Wheatsheaf. Three years later the 1891 Census listed Harry Atkins and his wife running the establishment. 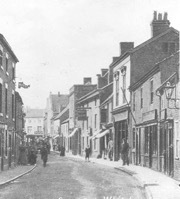 An 1896 list of licensed victuallers in Shropshire described the pub as being owned by Wilderspool Brewers of Warrington. Downstairs there was a bar and three other rooms while upstairs were 8 bedrooms containing 12 lodgers. Outside there was stabling for 30 horses during the day or 18 overnight. The next Census in 1901 listed yet another change in management. John H Cottrell is listed as a hotel keeper. His niece was employed as a barmaid. Four years later, according to Kelly’s Trade Directory of 1905, John Cottrell is still the proprietor. By 1926 Trade Directories listed the proprietors as Albert and Ethel Peach who were still running the establishment in 1947. Down either side of the building are alleyways. The one on the right led originally to the Wesleyan school which had been built on gardens between Green End and St John’s Street. It was described in “Whitchurch Schools” by Joan Barton as a cobbled way which led to the Girls’ playground. The alleyway to the left of the Wheatsheaf was known as Piccadilly and at one time joined up Green End and St John’s Street. Hung up at the junction of Piccadilly and Green End on the side of the Wheatsheaf were Firehooks. These were used like grappling hooks to pull thatch off buildings in the path of a fire. In March 2017 Albert and Ethel’s niece, Margaret Jenks, visited The Wheatsheaf and confirmed some of the above. As a child, during WW2, Margaret lived at The Wheatsheaf with her aunt and uncle (1942 – 1946). Margaret shared many old memories with us and we hope she will visit again.